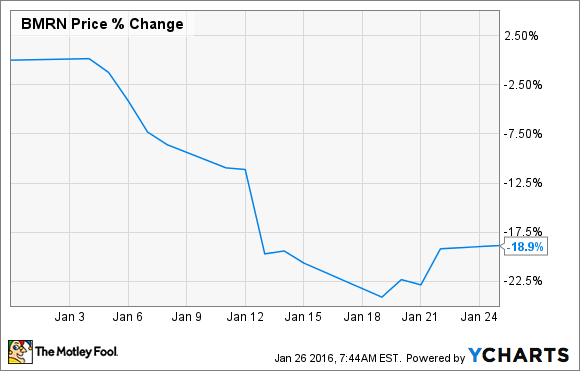 Will 2016 Be BioMarin Pharmaceutical's Best Year Yet? Despite stumbling at the start of the year, the biopharma appears primed to turn in another strong year in 2016. The underlying reason for BioMarin's rapid growth is its laser-like focus on so-called "orphan" drugs, or medicines indicated for rare diseases. Orphan drugs tend to have shorter clinical and regulatory lead times, come with certain tax advantages, and often have extended periods of exclusivity, making them highly coveted products by pharmaceutical companies and investors alike. In fact, orphan drug companies tend to sport the highest premiums (expressed as market cap divided by trailing-12-month revenue) in the entire healthcare sector. According to data gleaned from S&P Capital IQ, for instance, BioMarin's shares are presently trading at around 15 times the company's trailing-12-month revenue. Putting this number into context, Gilead Sciences (NASDAQ:GILD) -- one of the fastest-growing biotechs in the world -- is trading at less than 8 times its trailing-12-month revenue. Despite this double-digit pullback, BioMarin does have several upcoming catalysts this year that could maybe drive its shares to all-time highs. Here's why. At the recent J.P. Morgan Healthcare Conference, BioMarin announced that it expects total revenue for the year to top $1 billion for the first time in the company's history. A closer look at the numbers shows that a good chunk of this growth is being driven by the company's relatively new flagship product Vimizim, an enzyme-replacement therapy for the rare metabolic disorder Morquio A syndrome. By continuing the rigorous task of identifying new patients and subsequently getting them onto therapy, BioMarin has seen Vimizim's sales skyrocket since its commercial launch in 2014. This year, the drugmaker thinks this strong momentum will carry the drug's sales past the $300 million mark, putting it on track to grow by more than 25% from 2015. The long and short of it is that BioMarin's top line should still grow by over 30% in 2016, even after drisapersen's regulatory setback in the U.S., according to the analysts covering this stock. Besides its growing revenue base, BioMarin has one of the most impressive orphan drug pipelines in existence. In 2016, the company could file regulatory applications for both its experimental CLN2 disease therapy, cerliponase alfa, as well as its phenylketonuria treatment known as pegvaliase, depending on the progress of their respective clinical programs. Both of these experimental-stage drugs have the potential to add hundreds of millions to the company's top line within the next few years. BioMarin is also reportedly making excellent progress in advancing some of its other clinical-stage treatments for high-dollar markets such as achondroplasia, hemophilia A, and Pompe disease. The bottom line is that drugmaker's current pipeline and product portfolio could together end up generating an additional $4 billion in sales down the road, according to the company's managment. 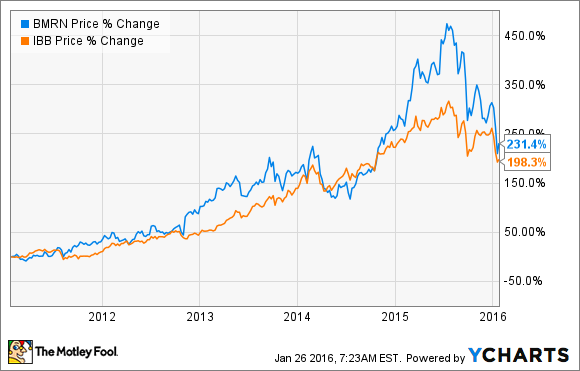 Is BioMarin a good buy in 2016? Despite BioMarin's setback with drisapersen, the company is a proven leader in the orphan drug space, and history suggests that it'll bounce back with additional regulatory approvals in the not-so-distant future. But the broader issue to keep in mind is that BioMarin isn't in the cross-hairs of the raging drug pricing debate that has weighed down the biotech industry, including top names like Gilead Sciences. Gilead, for instance, is struggling to shrug off the perception that further price discounts are coming for its hepatitis C franchise, which has been the biotech's biggest growth driver over the past two years. While orphan drugs have indeed received criticism in the past for their sky-high prices, the truth is that payers haven't offered much resistance because of the small patient populations. What this all means is that BioMarin's growth trajectory looks sustainable for the long haul, whereas Gilead's infectious disease drugs are probably going to continue to draw the ire of public and private payers alike. That's why BioMarin will more than likely bounce back from this recent pullback to turn in yet another strong year in 2016.